Love this picture! 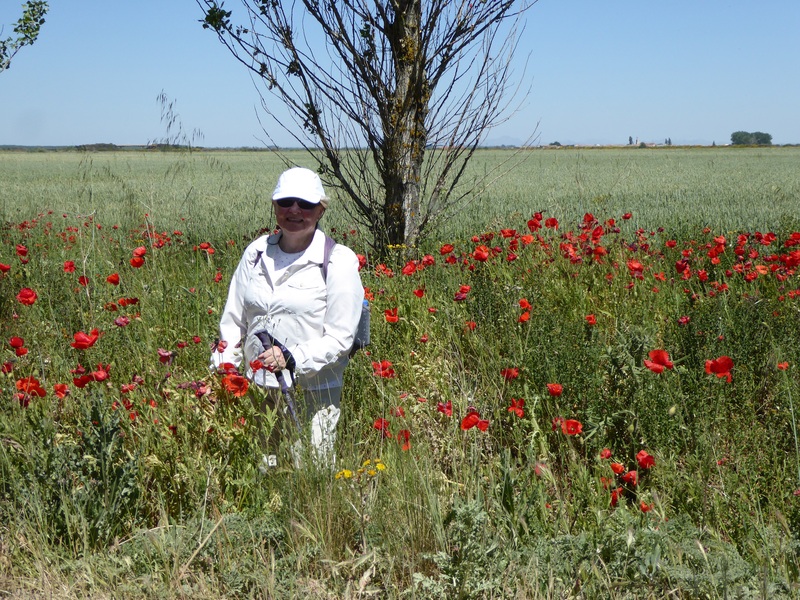 Delana surrounded by wild poppies growing beside a wheat field. A passing pilgram’s way of beating the sun! Unfortunately the two pictures I wanted to show side by side didn’t work out that way when I tried to post them ( many times…. Grrrrrr) so this was to have followed the one below showing Delana walking away from the camera. 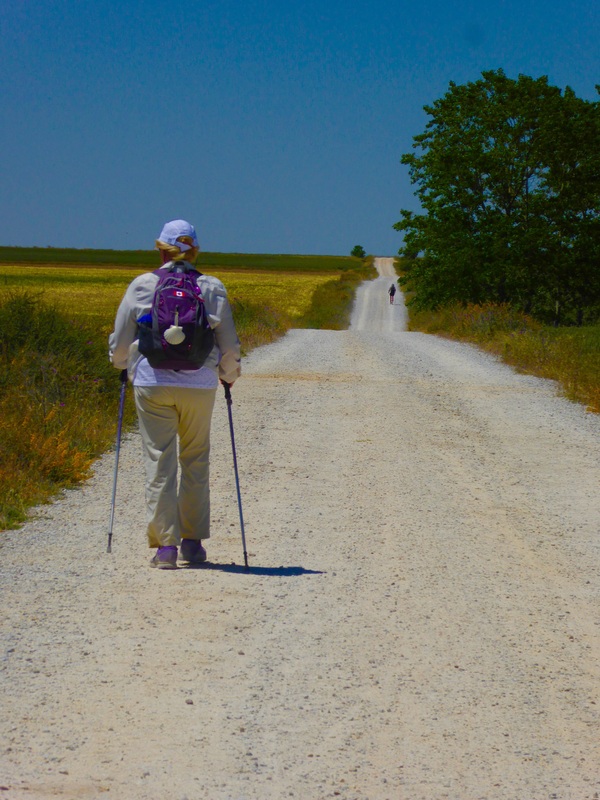 What I wanted to show was the serenity of travelling the Camino. The two pictures were taken 180 degrees apart …. 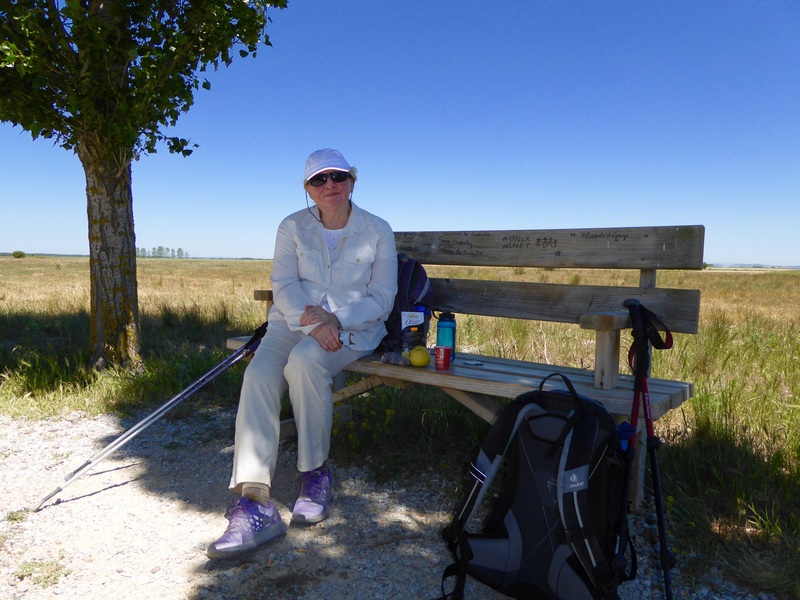 Not very crowded despite the fact that last Lear 224,000 signed up to walk some portion of the camino. 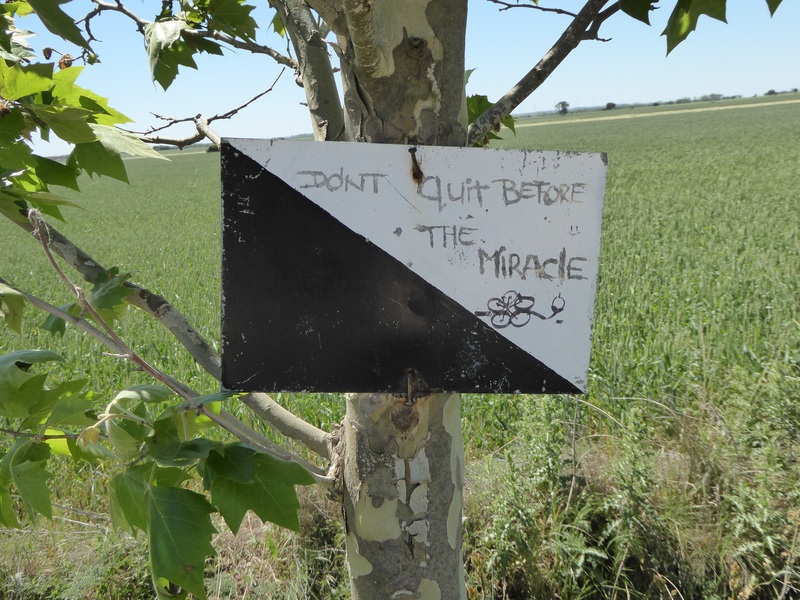 ” don’t quit before the miracle”is a beautiful Camino note on a hunting sign. The backgouund to the sign: the black and white sign is common as you walk in the Spanish countryside. The sign itself designates whether hunting is allowed or not. Like the French and Italians, the Spanish hunters kill thousands of songbirds each year, as they are unprotected and considered a delicacy by many people. There’s no tradition of conservation in Spain and most hunters are inclined to shoot anything that moves. Although they won’t deliberately shoot, it’s advisable to steer clear of the countryside during the hunting season. Lunch break! After 3-4 hours of walking a light picnic is a treat! 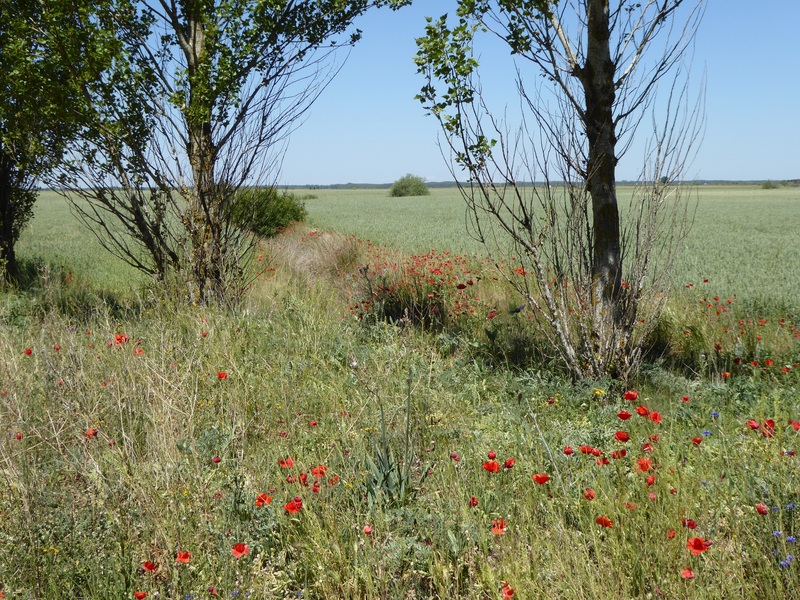 Picture beside: shows how beautiful wild flowers ( here showing poppies) grow everywhere but NOT in grain fields. Goes to show the success of big seed companies use of herbicides to control weed growth in grain fields. It is dramatic – there are no weeds growing within a meter of the edge of the grain field. It appears our room last night was constructed in the monastery stairwell–3 levels for a bedroom, a settee and a bathroom. Deciding it was a hazard we left lights on on all levels to prevent falling down the stairs in the dark. 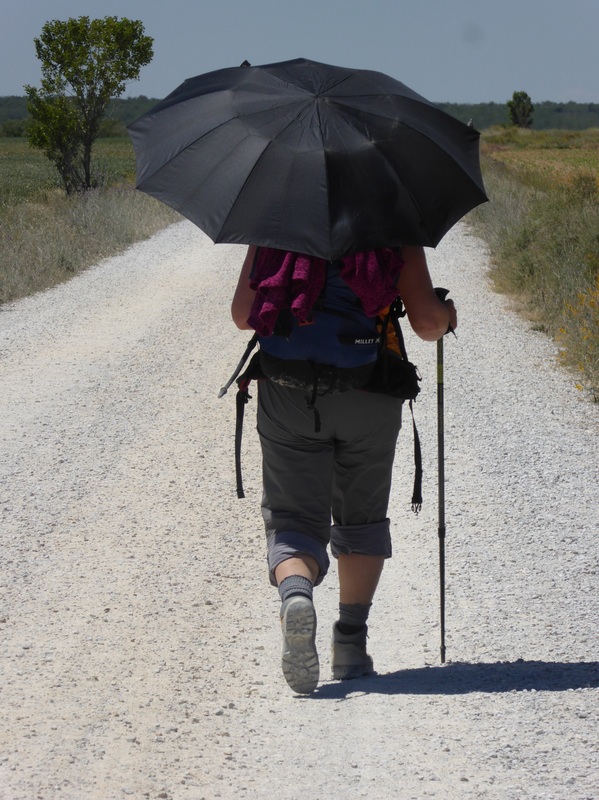 We were warned about the walk today—across the Meseta again but with no villages or water enroute. In the lingo of athletes (not us), we “carb loaded” at breakfast and packed extra water and food for the journey. There were two routes to choose today. 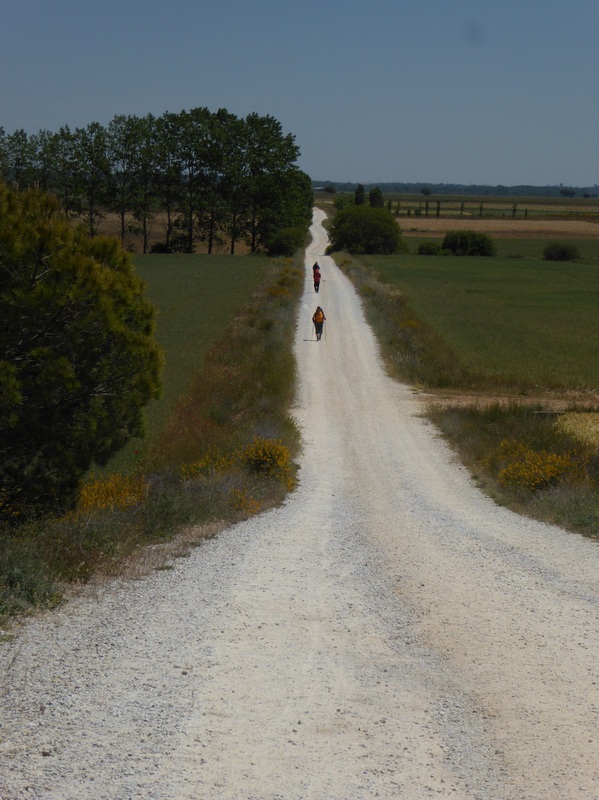 Having taken the “road less travelled ” on our first half of the Camino and getting lost, we chose the road more travelled this time. It was gravel with a moderate incline but seemed to go on and on. The sameness of the scenery along the way—farmland kilometre after kilometre contributed to the feeling of going nowhere. I think at one point the church we saw was a mirage. The temperature was 28C with no cooling breeze. Calzadilla de la Cueza is very quaint and tiny with a small hotel and an albergue., both run by the same genial fellow. The gentleman also is a local farmer and rides his front end loader from place to place. (Grandpa took a picture for you, Garner. 😊). All pilgrims ate dinner together tonight—there is only one restaurant.. It was fun. At our table were women from Ireland and England, a couple from Winnipeg, and a young man from San Francisco. We enjoyed their company very much. bells or raise their arm in greeting. Yesterday, as we were walking on a path alongside the highway, cars passing beeped their horns in acknowledgement. Pilgrims are essentially accepting and respectful of each other. It makes you wonder, why, if people can care about another person for 800km despite being tired and sore, there is so much inhumanity in the world.